Technology. Love it or hate it, technology definitely has a huge impact on life these days. I cannot even begin to imagine what the world will look like for my kids forty years from now, and what kind of jobs they are likely to have. One thing seems pretty certain though, being comfortable with technology is likely to be a key skill for practically any work (paid or unpaid) that they are doing throughout their lifetimes. Let's start with the format for these courses. It now comes as an online subscription, which isn't always something I like. I like having materials I can easily pass down from child to child. Subscriptions don't tend to work that way. That being said, this format is so easy to use. Log on, do the next thing. I love this presentation. Even though I OWN the books for many of their other courses, I fully intend to use the subscriptions for my kids. Completely worth it. The part I really love is the new monthly subscription option. You can still purchase a year of access to the course for $120. But now you can do a monthly subscription for $15/month. If your child is likely to get through the course in less than eight months, that would be a good option. 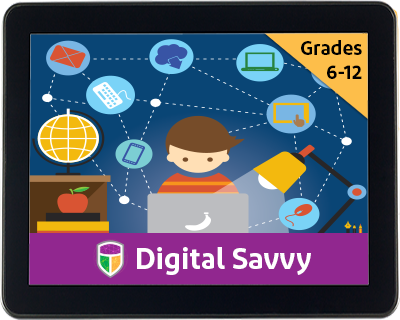 So Digital Savvy means what, exactly? This course is a pretty general computer knowledge class, meant for grades 6-12. I had all four of my children working in it (grades 5, 7, 9 and 11) as I know there are topics that each of them need. Trina, the 5th grader, is certainly capable of working through the material, though she is moving pretty slowly. Learning about the computer itself, and how to mange the information on there. Learning the basic office products - word processing, spreadsheets, presentations, databases. Learning about editing images, and using social media and email. Learning a bit of website design, and some simple computer programming. Learning about careers in computing. Thirty years ago, I could easily have taught most of that (the online parts were a lot different then though!) Now, I'm quite sure I could learn a thing or two in most of those topics. So having a coherent course that teaches this to my children is perfect. The student doesn't need a lot of previous knowledge, but they do need to know basic computer skills. They should be able to turn it on, use the keyboard and mouse, and that sort of thing. Parents do not have to be very tech-savvy either, as CompuScholar will directly answer student questions. Parents do need to not be techno-phobic though. What I really love is that my kids are all able to work on this fairly independently. Even the 5th grader. She told me that she finds it fairly easy to use, "but it is hard because I really don't care about any of this stuff so I don't want to." Yeah, well, I care. You need to know it, kiddo. The 7th grader is the most gung-ho. I told him that if he finishes this course, he can start doing Web Design next. He is completely in favor of that. "It's good and very informative. I was able to figure out some things to do to try to speed up a couple of the old computers we have." I'm going to let Richard describe how the course works. This is a very good course. For me, personally, I wish that learning how to build a website was a bit earlier in the program. When I first started this, I was very enthusiastic to get through this so I could build a website. But if you are wanting to generally learn about computers, I would recommend it." First, I watch the video. The lesson text is essentially the video script. I think it is really great to have the video going and read along in the student text. If you have the time, it is good to do both though, separately, as the repetition helps you remember. If you are already familiar with one of the topics, it will probably suffice to just watch the video. After learning the material, there is a quiz for each lesson. It's five questions, usually multiple choice. You get three attempts. At the end of the chapter, you will get an overall quiz, which will have twenty questions on it. You really need to remember the lessons to finish the chapter quiz. Some lessons will have a "work with me section" that will be like a mini activity. It will be something that will relate to just that lesson. Some will have activities that relate to the entire chapter. The program grades the quizzes, so I don't have to do that. I do need to grade projects though, and CompuScholar provides grading rubrics and other suggestions to help with that. I highly, highly recommend these courses. You can see what other Crew members had to say about Digital Savvy, Web Design, and Java Programming.